Olivos Whales learn about absorption. What happens when an object comes in contact with water? The Whales' teacher showed them different objects and asked them to predict what would happen if those objects came in contact with water. She showed a sponge, cotton wool, lids, plastic and paper. They all brainstormed different answers and developed their own hypothesis. In order to find out the results, they had to try each element in the bowl by pouring water on it with droppers. 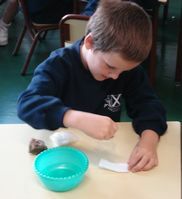 They learnt that water is absorbed in some objects but not in others.